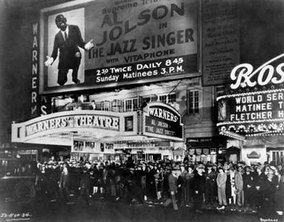 The Jazz Singer opening night in New York, Oct. 6, 1927. In 2005, Andrea Oberheiden and Jens Reinke started to research on Al Jolson with the goal to produce a feature-length documentary on the life and times of this great entertainer. As a by-product, they produced a research film called „Al Jolson and The Jazz Singer“ which focuses on the first talkie in the history of films. It had its premiere on July 12, 2009 in Kiel, Germany and was also shown in England, Malta, Australia, and the USA. Check out „Al Jolson and The Jazz Singer“. Here is the direct link to the film site. For more information about Andrea’s film work, please check out her website. 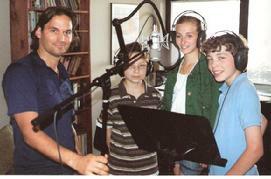 Kiel, October 2011: Andrea became one of two associate producers of Chip Deffaa’s „Seven Little Foys“ cast album. For more information on the play and on the cast album, please visit Chip Deffaa’s website.